- 3X Magnifier with Flip to Side Quick Release Mount. - This Magnifier can be mounted behind a 1X Reflex optic. You can quickly switch between 1X Magnified Optic for close ranges to 3X Magnified optic for intermediate to longer ranges, with a push of a button and a simple flip to side movement of the magnifier. - Magnifier features a quick focus ring to keep the image in focus. 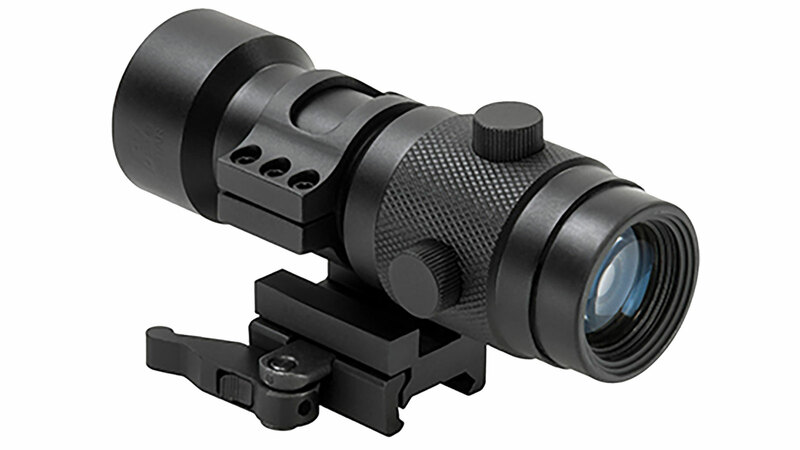 - Elevation and Windage adjustments with turret caps, to center your reflex optics reticle in the center of the magnifier. - Locking Quick Release Mount, attaches to virtually any Weaver/ Picatinny/ MIL-STD 1913 type rails. - Magnifier can be flipped to the side by depressing a spring loaded button and flipping top half of mount and magnifier to the side. Mount locks into either down or side positions.